We needed a bag for on our bike when we took a recent trip to Colorado. This bag expanded beyond what we could have imagined, which is great for a woman that packs like she is vacationing for a month!!! You will not be disappointed! Great quality and not overly expensive! Get easy access to whatever you need while you ride with this large leather and nylon sissy bar backpack. This bag features a durable, premium leather and 1220D nylon construction and comes with a waterproof rain cover to keep your belongings safe through almost any conditions. Easily mount the bag and get convenient access to your belongings with multiple outside zippered pockets as well as a side water bottle holder and bottle. 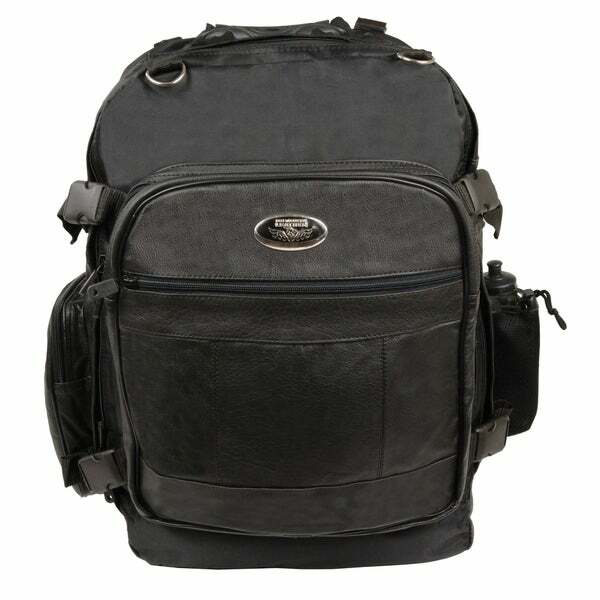 The bag also features an inside concealed holster for a gun and ammo, so you can feel safe wherever you ride.